Chop the onion. Add the water to a small saucepan and bring to a low simmer over medium heat. 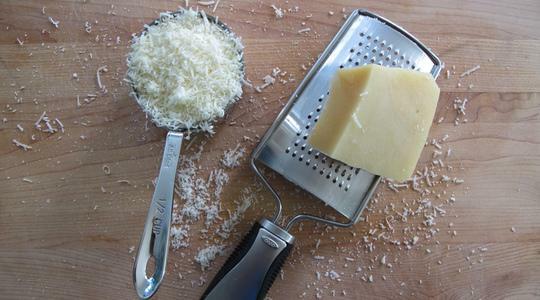 Grate the Parmesan. 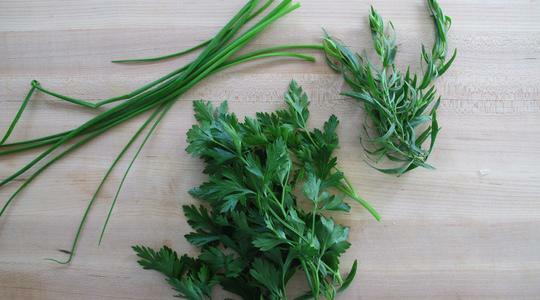 Rinse the herbs and pat dry with a paper towel. 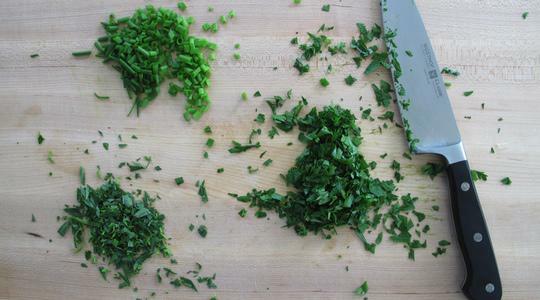 Chop the herbs. Place a large saucepan on the stove and turn the heat on to medium-high. Add the oil and heat until it shimmers (about 1 minute). 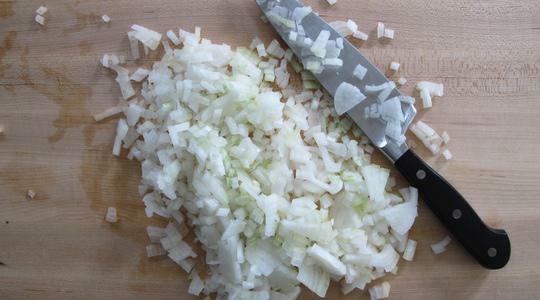 Add the chopped onion and cook, stirring often, until softened but not browned, 5 to 6 minutes. Add the rice and stir to coat in the oil for 1 minute. Then add the wine and cook until it is nearly evaporated. 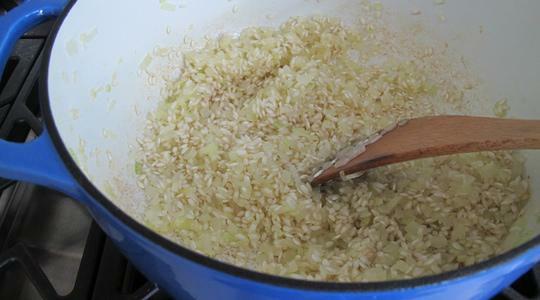 Use a liquid measuring cup to scoop out 1 1/2 cups of the hot water and add to the rice, lower the heat to about medium so the rice gently bubbles, and cook, stirring often with a wooden spoon, until the water is absorbed. Repeat and cook the same way with the next 1 1/2 cups of water. For the next addition, add just 1 cup water and cook accordingly. Now taste the rice for doneness- it should be al dente but not crunchy. If it’s still a little crunchy, add the remaining 1/2 cup water and stir while it cooks. 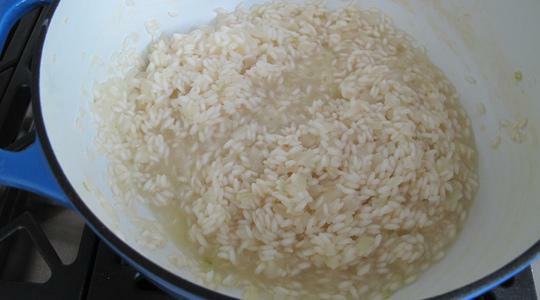 The rice should take 20 to 25 minutes total to cook. 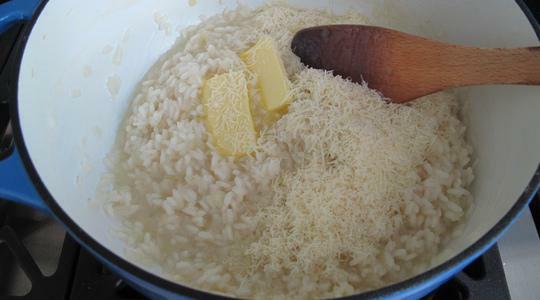 Turn the heat off; add the butter and Parmesan and stir vigorously until melted and creamy. 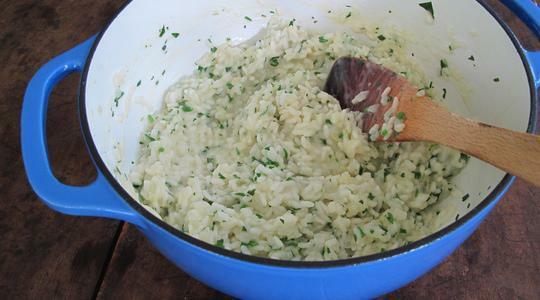 Stir in the salt and chopped herbs. Taste for salt- you may want to add a little more. 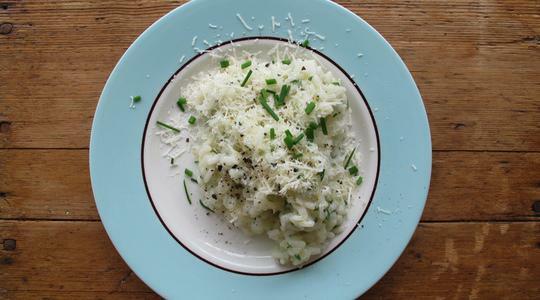 Serve topped with pepper and Parmesan.